Camden Lamar Heights, off North Lamar near midtown Austin, boasts modern one and two bedroom apartment homes. Just a short drive from this ideal location in the Austin Triangle, enjoy great bars, trendy restaurants and endless shopping options. Head over to a popular Texas BBQ joint or catch some live music at one of Austin’s historic music venues. Venture a little farther south for some vintage shopping and night life off the Drag. For your daily commute, our community will get you where you need to go. We're conveniently located near I-35 and US183, just three miles from MoPac Expressway, and a quick drive to downtown Austin. Ready for a night in? 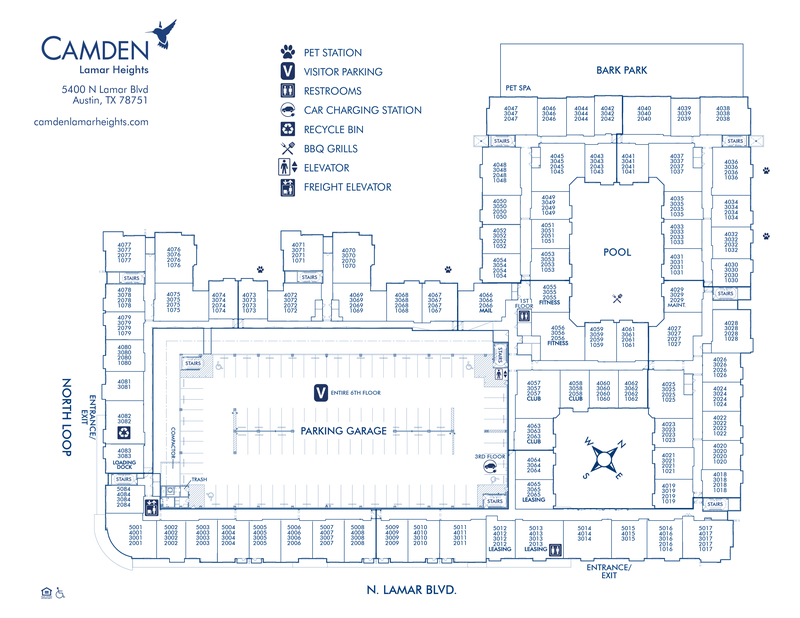 The apartment homes at Camden Lamar Heights have everything you need! Our open-concept kitchens feature stainless steel appliances including refrigerators with ice/water dispensers and glass stovetop, white quartz countertops, tile backsplashes and pull-down sprayer faucets. Step into a spa experience every day in the garden bathtubs with tile surrounds, framed bathroom mirrors and curved shower rods. Full-size washers and dryers, walk-in closets and USB outlets provide convenience while pendant lighting, hardwood-inspired flooring and private patios and balconies add a final design touch! Cancel that gym membership and stay fit in the 24-hour fitness center, which is one of the largest in the area. We've got everything you need including cardio equipment, strength training machines and free weights along with yoga essentials and full spin cycles. Entertaining friends? Take them to the beautiful resort-style swimming pool complete with a shallow lounge area. Plus, we've got an outdoor lounge with grilling stations and dining space so you can barbecue without missing the game.Our resident lounge has a gourmet, entertaining kitchen, poker and billiards area as well as a TV and comfortable seating. Catch up on work outside of your apartment in the cyber lounge area with WiFi and on-demand, gourmet coffee machine. Your furry friends will love it here too! Our private, controlled-access dog park is the perfect place to play and get exercise off-leash. Plus you can easily wash Fido after he's played with friends at our paw spa grooming station. Socialize with your pet on the weekends at nearby Yard Bar where your dog can roam and play plus you can enjoy a bite to eat and a drink. Your car will be happier out of the Texas heat in our direct access, gated parking garage, which has visitor parking on the top level. Plus we've got electric car charging stations available for residents. Residents receive a technology package included in the total monthly rent with a savings of up to 50% off retail. This money-saving package includes high-speed internet up to 18 Mbps and up to 200 digital channels including DVR. Looking for more options? AT&T allows you to upgrade any of their services like internet speeds up to 300 Mbps and additional cable packages. Starting or expanding your business? Tired of your long commute? We have the perfect solution – Live where you work in our live/work apartment homes! Our community offers unique one and two bedroom live/work spaces that combine your business and residential needs. Our live/work lofts include generous space for both needs in a centralized location only minutes from downtown Austin and right off booming North Lamar Boulevard. Please call to learn more about our Austin live/work spaces. Looking for an amenity-rich community with modern finishes in the perfect location? It's not too good to be true - it's Camden Lamar Heights! We have ample open parking in our direct access, gated parking garage for our residents on a first-come, first-served basis. Visitors are welcome to park on the top floor of the garage. Inside the garage, you'll also find electric car charging stations available for our more eco-conscious residents!